The privilege of working with the Luv Ya Blue era Oilers for We Were the Oilers led to a lot of research and subsequently much thinking. If memory serves me correctly, a lot of the talk around the Dan Pastorini for Ken Stabler trade between the Oilers and Raiders pointed out that “Stabler’s beaten the Steelers, Pastorini’s lost two years in a row.” Over time, a generally accepted theory has been that Pastorini and the Oilers simply couldn’t beat the Steelers. There’s hinting that perhaps if the Oilers had a better quarterback, maybe they would have won. Looking back as objectively as I can, here is my own new theory about this. First, the Steelers lost only 1 home game between 1978 and 79 – a Monday Night Football loss to – Dan Pastorini and the Houston Oilers. Second, the Steelers only lost 6 games total in 78 and 79. Who was the only team to beat them twice? Yep. The Pastorini-led Oilers. 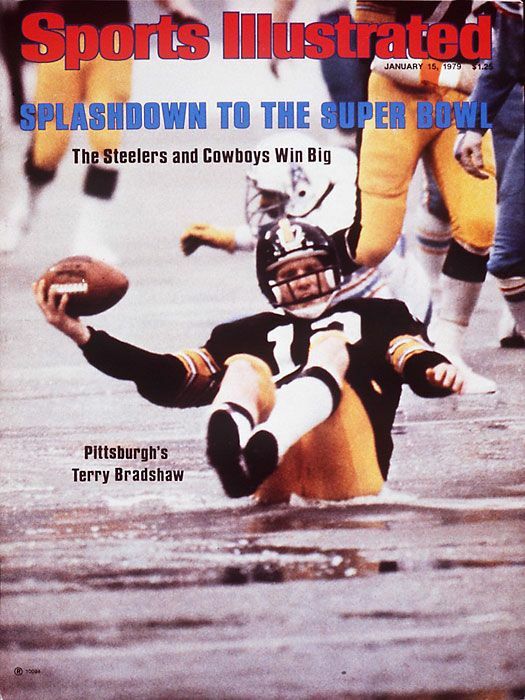 Turns out Terry Bradshaw and company only lost 1 home playoff game throughout the entire 1970s – the 1972 AFC Championship to the undefeated Miami Dolphins. Not to start any greatest ever arguments, but those 17-0 Dolphins were one of the greatest teams in NFL history. While it’s easy to point out that the Oilers didn’t beat the Steelers in two straight AFC Championship Games at Three Rivers Stadium in Pittsburgh, the facts are that nobody was beating the Steelers there. Especially in 78 and 79. In reality, Houston was the only team to win at Pittsburgh during that time. History doesn’t always have the best memory. Dan Pastorini and the Oilers may have actually been the biggest threat to the back half of the Steeler dynasty. Agree or Disagree? Friendly comments welcome. Saying something like “if the Oilers had a better QB they would have won” is tantamount to saying if the Oilers weren’t the Oilers they would have won. That’s a ludicrous argument, not to mention disrespectful to Pastorini, who was not the weak link. In ’79 they had a better shot at winning than ’78. Remember the early Steelers had White and Holmes teaming up with Joe Greene and L.C. Greenwood in the early ’70s as opposed to Gary Dunn and John Banaszak. In ’79 Jack Ham was injured and missed the entire playoffs. They had a real chance in ’79. Not a good chance, but a real chance. The fact that they even got to the game to begin with is amazing. Vernon Perry’s 4 picks in one game made way for an upset victory over the Chargers. Everyone was looking for a Steelers-Chargers match-up in the title game. The Steelers WRs were better than the Oilers WRs and the Steelers DBs were better than the Oilers. Granted Pastorini threw 5 picks in the ’78 Championship, the score in that game became lopsided due to turnovers. However when you analyzed the teams going in to both playoff games, the Steelers key edge was the WR vs. DB match up on both sides of the ball. I love the Steelers-Oilers rivalry of the late ’70s. They were the two most physical ball teams, but they were both clean and honorable. It was great football, fun to watch. The Oilers were a great team, just not great enough to contend with Pittsburgh in the ’70s. Then again who was? Great points….the Bengals who won the AFC after Bum was fired, weren’t exactly unbeatable. Neither were the Raiders who won the Super Bowl during Bum’s last year….had the Oilers still had Pastorini and he stayed healthy that year, one also may wonder if the Oilers would have had a better chance that year also. Bum even said that he felt that there was no way they were going to beat the Steelers at 3 rivers. He did say that if he had not been fired the Oilers would have been in it the next year, but that is a whole ‘nother article. I know that the conventional wisdom was that if Renfro would have been ruled “inbounds” game would have been tied and our chances would have increased (Pastorini insists on this today!) but I think Bum was correct.